After the terrible opposition winning over the Barisan Nasional in the recent PRU12 (the 12th National Election), Dr. Khir Toyo was not only lost his Menteri Besar position, he was also passing on a few UMNO positions at the state level. Who are the majority now? What majority are you talking about? So now they've seen it happen. The bloggers has changed the world, why not Malaysia? And now even Dr Khir has his own blog. Maybe Dr Khir was thinking that blog can really make a living then. Yalah, after losing the election, of course jatuh miskin aight? Recently I met him and I find out something! THE BOTOX WORKS REALLY WELL! He has grown taller and bigger. No more white hairs and look so young and energetic as ever! The face looks so different nowadays and he even changed profession. He looks very much handsome too! The botox even changed his career. He is now a photographer! And giving talks at the Photography Roadshows as in the picture below. Believe it or not @ life.izham-miyake.com! Well, It's April Fool and of course it's a joke! Hahahaha! "Dah tak jadi Menteri Besar ke?" And i burst with laughs! 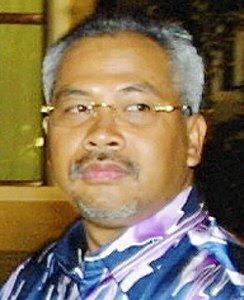 Now only I realized that Noorsham looks like Dr. Khir Toyo. 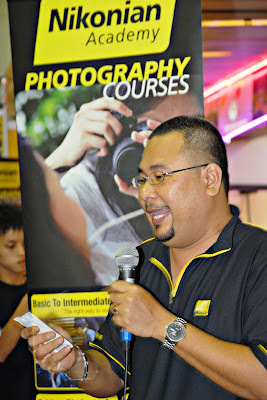 Of course that handsome guy is Mr. Noorsham, my sifu, who was giving talk at the Photography Roadshow in Plaza Pudu KL. More about it at my Website. * So boss, jangan marah eh. Hehehe.. gurau je.. I'm not alone. Are you with me? One tiring but nice weekend.